If you are searching for naturally high acidic coffees you will probably look to Sumatran blends and single origin coffees as they are commonly found in stores and coffee roasteries all over the place. In fine coffee tasting circles – the cuppers world – acidity is one of the more commonly agreed on “good things” and about fine coffee. Most gourmet coffee growers pride themselves on producing coffees at higher altitudes with “brighter” or more acidic coffees. Truth be told I prefer the taste of higher acidity in my coffee but many people do not appreciate the brightness. In fact in the USA there is a big trend for bulk coffee makers to produce coffees that are not all that acidic. They market these coffees as “smooth” and Sumatran coffees tend to cater those people quite nicely – they tend to be less acidic categorically. Of course there are some micro-regions and growers that do produce acidic “bright” coffee but on average the region is not known for high acid. Sumatran coffees on average tend to be lower in acidity than other regions of the world. Those Sumatran coffees which are grown at lower altitudes and those that are roasted a bit darker tend to have even lower acidity even within the region. Related – Is Kona Coffee Good for Espresso? As I pointed out in my recent post on low acid coffees coffees grown at lower altitudes tend to have lower natural acidity than those grown at higher altitudes. Darker roasts tend to be lower in acidity than lighter roasts. And regionally speaking Sumatran coffee (on average) is some of the lowest acid coffees in the world. Why is that? – It’s on a small island chain in the Indonesian chain. Typically higher elevation regions produce more acidity. Other interesting characteristics of most Sumatran coffees include the unique flavor profile of the final cup. No matter how you brew a Sumatran chances are great you’ll notice the difference in flavor from most other regions right away. They taste earthy – almost like they have a bit of dirt in them… but in a good way. In some ways the earthiness can be a turnoff but it’s such a smooth flavor and weight in the mouth that most people enjoy it for it’s uniqueness. 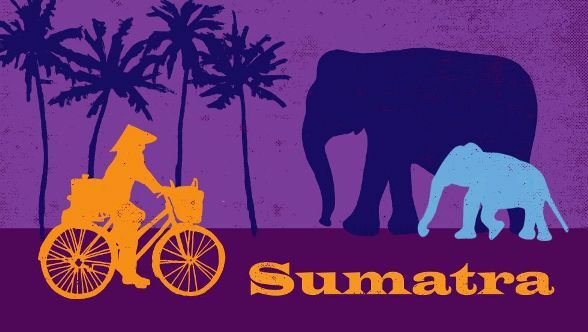 SweetMaria.com has an awesome description of Sumatran coffee if you’d like to learn more about the region and the flavor profile. For those people on low acid diets — or for those people who have trouble with the stomach upset that sometimes comes from high acid / high caffeine coffee — a dark roasted Sumatran gourmet coffee will typically deliver a great cup without being too acidic. This blend is not going to be magic, there is still an acidic element to it, it is after all still coffee. To read a bit more on this you may want to see this post on the health benefits of coffee. If you are really concerned about getting as little acid in your cup of coffee as possible then Puroast might be your next best bet. This company makes a coffee that is significantly lower in acid – 50% less according to their packaging. It’s what they do. You can start by having a look at Puroast’s House Blend Drip Grind here or their decaf version here. For those people who simply love interesting flavors that are complex then the low acidity of Sumatran coffees might be a welcomed treat. Sumatran coffee originates from Southeast Asian region, particularly in Indonesia. This coffee has a deep, earthy taste due to its dark roasting process. It has a savory aroma and a cocoa undertone. Needless to say, Sumatran coffee is one of the low acid coffee known in the coffee industry. This is in fact due to the low plains where coffee plantations are located. Higher altitude makes coffee more acidic. Low plains reduce the acidity of coffee beans. Indonesia is the third largest coffee producing country in the world today. It comes after Brazil and Vietnam, followed by Columbia. Sumatran coffee is commonly served in popular coffee shops. When blending coffee , Sumatran coffee is the perfect partner blend for highly acidic coffee like Ethiopian, Kenyan and Guatemalan coffee. Robusta coffee beans are grown in North Sumatra. Popular regions that produce robusta beans are North Tapanuli, Toba Samosir, Samosir, Humbang Hasundatan, Simalungun, Dairi, Karo Mandailing and South Tapanuli. Owners of Indonesia coffee farms should put in place self-development programs to keep its farmers up-to-date with the current best practices in terms of coffee farming. Trade organizations are keeping an eye on these conditions and ensure labor laws are in place and observed. Coffee farmers use animal manure without chemicals for fertilizing the land. This slow down the process of harvesting and affects the yield production. Sumatran plains are similar to that of Brazil. If Sumatran farmers can adapt modern farming methods used in Brazil, they can easily multiply the yield of coffee production. Coffee farmers in Sumatra rarely use machine to process their coffee beans. This has positive and negative effects. The good part is that farmers keep the good quality of their coffee by maintaining the manual process. However, they can only produce raw coffee beans and hard to diversify into other coffee products. Coffee experts describe Sumatran coffee as one of the most complex tasting coffee in the market. It has the aroma of spices given the location and orientation of the land as well as a strong earthy taste knowing that the Sumatran plains is part of the Pacific Ring of Fire. Sumatran coffee has a smooth texture but sharp aroma. There is an existing plan to convert coffee farms into palm tree farm for palm oil production because it is more profitable than coffee. If this continues, it can affect the world’s coffee production. Luwak coffee beans is obtained from droppings of mongoose, an endemic Sumatran animal that loves eating coffee beans. The Luwak is priced at $150 per 500 gram. It has a delicious taste, unique and fragrant aroma. If you love Starbucks, you love Sumatran coffee. Starbucks uses the Arabic beans grown from Sumatran soil. Sumatran coffee beans is one of the best-selling coffee in Starbucks. If you want a nice espresso shot, use Sumatran coffee. The famous brand Stumptown imports Sumatran coffee beans for their popular labels like Sulawesi Toraja Toarco, Organic Sumatra Bies Penantan and Sumatra single origin. What is the taste of Sumatran coffee? Because of the high moisture content, the fermentation process happens even if the beans are already stored and waiting to be roasted. This fermentation helps develop the dynamic flavors inherent in Sumatran coffee. Is coffee acidity bad for you?